The fake Army unit followed throughout In Country. We're forgetting about Vietnam and perhaps we're doing that on purpose. Today's American history textbooks all but skip over the conflict, which lasted a decade and claimed the lives of nearly 60,000 Americans. But in the woods outside of Salem, Oregon, there are at least a few folks fighting to keep the war alive. 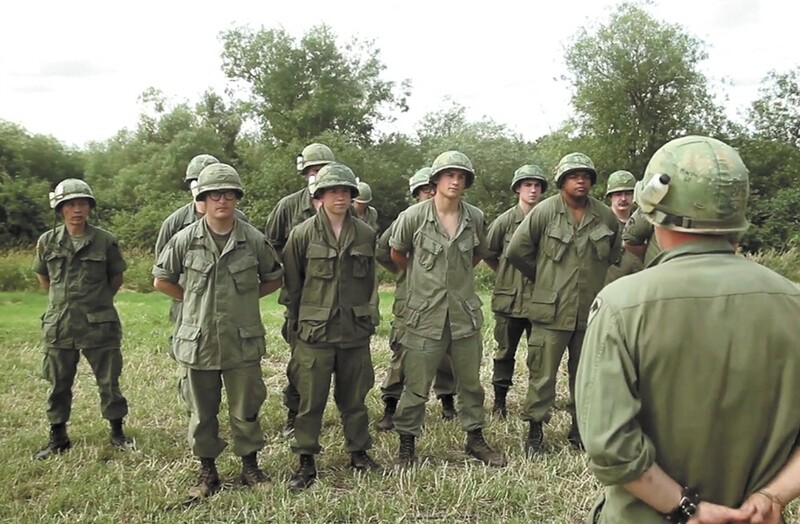 In Country follows a dozen or so men who dress up in Vietnam-era military uniforms and hump through the countryside pretending that it's the late 1960s and they're fighting an enemy neither they nor their leaders really understand. They use lingo of the day and keep an eye on authenticity, even bringing along an actual Vietnam combat veteran to keep them on point. The ammunition is fake, but the devotion this odd assortment of gentlemen put forth in this documentary is very real. Directors Mike Attie and Meghan O'Hara have a treasure trove of interesting subject matter to explore, and for the most part they present it all with fascinating zeal. But it seems that even they don't exactly know why these guys — some of them veterans of Iraq or Afghanistan — want to spend their weekend playing dress-up and acting out fake deaths. If you're waiting to learn the why, you'll leave the film still wondering, and that's its shortcoming. That said, we do get some clues as we follow the characters away from the fake battlefield. There's a real-life grunt who went to Iraq right out of high school and is preparing to leave his wife and four kids for a tour of Afghanistan; he serves as just one of the filmmakers' very on-the-nose reminders that war is real and it's not fun. We also see an Army medic who's suffering from PTSD as a result of tours in Iraq; he can't quite tell us why he'd want more war when all it got him was a head full of nightmares. The best justification for the recreation comes from a man who fought for the South Vietnamese army before coming to the U.S. He says putting on the uniform and sleeping under his poncho makes him feel like himself. In Country is not showing in any theaters in the area.